Silhouetted against the Beartooth Mountains, the rusted exterior of the Olivier Barn comes into view as a pleasant surprise, like the ocher moss that covers the rocks in the region. Its monochromatic exterior composes with the uniform tone of the landscape like the notes of a musical chord. Building components are situated on the land away from each other in order to free the main performance building so it appears as a simple barn silhouette in the distance. The utilities, located in an underground concrete structure, disappear in the landscape, and the residences are set privately along the creek. Lisa Delplace and her team at Oehme van Sweden, the project landscape architect, fine-tuned the gradual discovery of the building against the mountain backdrop like the opening of a theatrical curtain. The barn, with a pitched roof, windows at a high level for natural ventilation, and large sliding doors, is posed on a gentle slope near a creek. Within the all-rusted exterior, as within a shell, is an all-timber interior. As a landscape architect and painter, I was struck upon my first visit to Tippet Rise by the vast, rugged grassland landscape and the land’s rich textures and colors in hues of zinc, sienna and ocher set against cerulean blue skies. Inspiration always begins with a strong sense of ‘place’ and a design that amplifies the experience of natural forms and contours. The location of site elements and design of entry sequence, circulation, paths, trails and outdoor spaces are intended to feel as though they have always been here. The rich textures and colors of materials found on site guide all elements of design. The rusted metal and weathered wood fences on the ranch are referenced in new site elements such as Corten steel posts of the new curvilinear ranch fence. Moss-covered rocks found on site inspired the selection of a local Montana Moss Rock stone, sourced from ranches throughout the state, for use on walls and at the base of the Music Barn. The subtle color of wildflowers found throughout the property informed the selection of native seeds for planting at the Music Barn site. 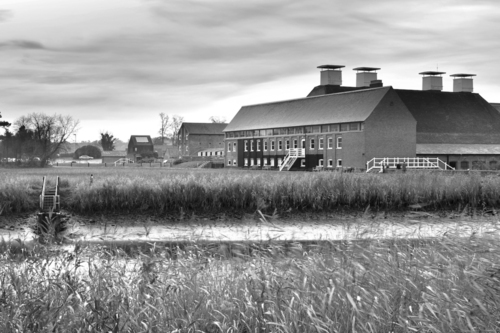 Snape Maltings Concert Hall, located in the bucolic British countryside, inspired a lot of the architectural planning for Tippet Rise. Its buildings are distributed on the land like an agricultural compound or a small medieval village. Peter Halstead describes the interior of the spaces as creating an almost druidic atmosphere. 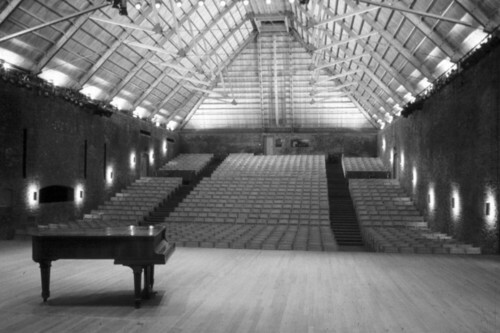 Revered internationally for its pristine acoustics, Snape Maltings is Cathy and Peter Halstead’s favorite concert hall and the reason why they selected Arup, the venue’s original engineers and acousticians, to be their acousticians at Tippet Rise. The acoustical design of the Music Barn at Tippet Rise follows inspirations from Snape Maltings: a few simple materials, a pitched ceiling that forges a particular sound signature, and timber framing helping the diffusion of sound. 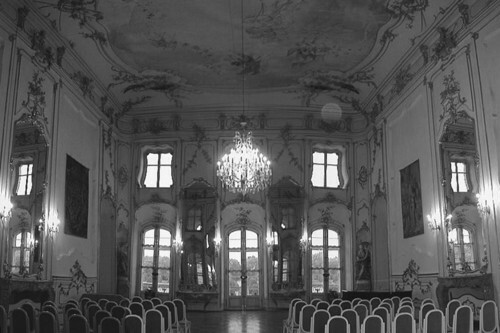 Researching some of the most intimate and enveloping acoustical spaces, we also took inspiration from rooms used by classic composers such as the Music Room in the Esterházy Palace of Hungary, extensively used by Joseph Haydn for the composition of his chamber music. A design emerged blending the qualities of both spaces. 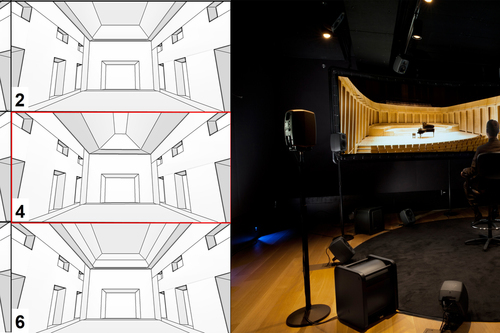 The acoustical design was fine-tuned through computer simulation and listening studies in the groundbreaking ArupSoundLab. This allowed us to hear exactly how music would sound in different virtual room prototypes before the space was constructed. The study set the final dimensions of the performance space and the shape of the ceiling, combining both flat and pitched ceiling, and meant to enhance the acoustical envelopment and intimacy. As a student at the Harvard Graduate School of Design, Laura Viklund decided to revive heritage construction and long-lasting timber frame structures in a modern context – an original move in modern architecture trends. She and her husband Chris Gunn later moved to Wyoming and founded Gunnstock Timber Frames. Struck by their honest and true rustic architectural style, Tippet Rise appointed them as the architect for the Olivier Barn and its residences. When we first signed on to this incredible project, Fishtail, Montana seemed the unlikeliest of settings for a classical music concert hall and Art Center. Then we spent time touring the area with Peter and Cathy Halstead. Their commitment to the project and the land was infectious and we realized this was an idyllic setting for such an institution. 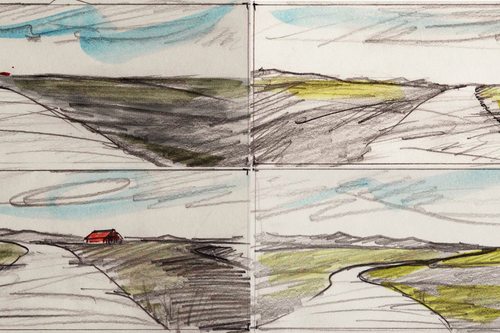 The landscape of Tippet Rise, much like the people of the area, has a humble confidence. Gently rolling hills dotted with livestock flow into handsomely rugged canyons that frame the Beartooth Mountains. It was important to us to try and create a building that would be respectful and celebratory of the land, the community and the music at the same time. When you first enter the building you are immediately surrounded by the warmth and beauty that come from a wood barn. 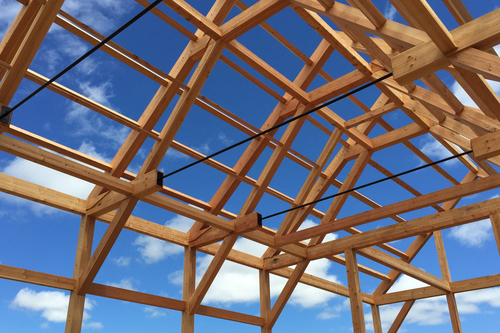 A timber frame is proudly visible throughout the building as a demonstration of not just structure, but also craft. You can see the hand of the maker in every joint cut from trees grown nearby, and it helps foster a more personal relationship with the space. 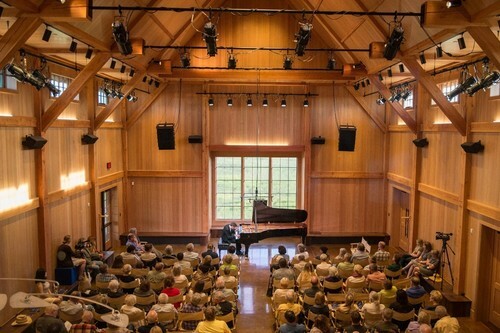 The unique shape of the timber roof inside the concert hall is meant to both aurally and visually enhance your listening experience. The large window at the end of the hall frames a backdrop of the Beartooth Mountains, so you never lose the connection to the landscape while experiencing the music. The use of wood, metal and stone as our primary materials felt in keeping with the rustic vernacular architecture of the area.